​The Town of Scituate and Scituate Wind, LLC jointly announced that the Town-hosted wind turbine at the wastewater treatment facility has reached a major economic milestone in terms of the net benefits provided to the Town from electricity production. As of the end of 2016, the Town had received over $1,000,000 in income from hosting this renewable energy project. This announcement was made less than two years after the joint announcement that the benefits accrued to the Town of Scituate exceeded $500,000 and before the fifth anniversary of the turbine’s commencement of operations. Scituate Town Administrator Patricia Vinchesi said, “the wind turbine continues to accrue substantial economic benefits for the Town of Scituate while representing Scituate’s commitment to renewable energy. Scituate, especially as a coastal community, is proud to be a leader in renewable energy generation in the Commonwealth and is pleased that, through its agreements with Scituate Wind, the Town has stabilized its energy costs for 20-years.” The agreements with Scituate Wind provide the Town with reliable energy prices for the life of the contracts while aligning the Town’s and Scituate Wind’s incentives to increase production to the benefit of the partnership. Scituate has been recognized as a leader by the Commonwealth of Massachusetts for its commitment to renewable energy development. Scituate hosts the wind turbine and a large solar array which, combined, produce enough electricity to power all of the Town’s municipal accounts. The renewable energy certificates associated with the turbine project are sold to the Mass Energy Consumers Alliance, allowing all of the output from the wind turbine to be accounted for locally. 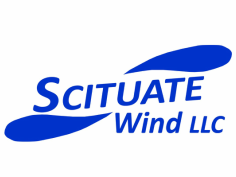 The Town of Scituate and Scituate Wind, LLC jointly announced today that the wind turbine at the Town’s wastewater treatment facility had reached a milestone in terms of the net benefits provided to the Town from electricity production. As of the most recent billing period, the Town has netted over $500,000 in income from its participation in this public-private partnership. While the Town pays Scituate Wind for all of the electricity that the turbine produces, it receives net metering credits from National Grid for that power. In addition to the benefits from energy cost savings, the Town has received over $75,000 in property taxes. Scituate Town Administrator Patricia Vinchesi said, “the wind turbine facility has delivered relative to two important town goals: to provide additional revenue to offset increased operating costs which has allowed us to use these funds to subsidize part of the debt for the new middle school and public safety complex, and to become the first community in Massachusetts to be using renewable energy sources for over 100% of our electrical needs.” The arrangement with Scituate Wind means that the Town is insulated from spikes in electric rates such as consumers are currently experiencing. Electric rates have increased over 170% since the turbine first when on line less than three years ago, in April of 2012. Scituate, which is home to both the wind turbine and a large solar array on its closed landfill, has been recognized by the Commonwealth of Massachusetts for its activities under the Green Communities Act, receiving over $252,000 in grants from the state for other energy initiatives. All of the electricity produced by the turbine and the solar installation is net metered to the Town’s municipal accounts. The renewable energy certificates associated with the turbine project are sold to the Mass Energy Consumers Alliance, allowing all of the output from the wind turbine to be accounted for locally. Read the Fairhaven Neighborhood News. Scituate, MA receives Leading by Example Award. Scituate Wind is a 1.5 MW Wind Turbine Project located at the Wastewater Treatment Plant in Scituate, MA.